I have been exercising my wrist with a few oddments. Firstly I had a go at clunies or point d'espirit. It had been difficult with bobbins to get them even and the same size...and my tatted ones are no better! I finished off a couple of shuttles with Mary Konior's "curds and whey" in 100 gutermann and 80 DMC. I used Pamela's Coral Reef for this motif based on triangles and split rings from the Ring of Tatters magazine. 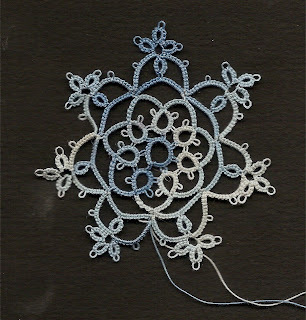 I had been listening to a programme about "Affluenza" the disease of the Western World, where we want more than we need, and we buy stuff and it makes us unhappy...and I got to thinking about tatting books I have bought, but never done a pattern from. I decided that 2009 would see a change, and so this is a motif from a book I haven't used before. Frivolité by Bernadette Baldelli. Don't buy it! It's not much good, the patterns aren't very inspiring and the instructions aren't very illuminating either. 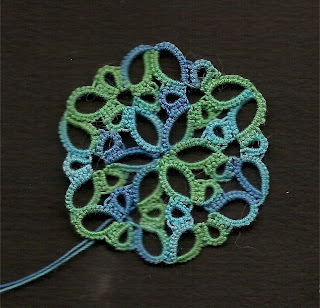 This was patterned to be worked in 4 rounds, but with a split ring and my first ever split chain I managed it in one go. I hope the next book is better! I loved your post! I think I suffer from tatting Affluenza! LOL! Seriously. Ya know, several bloggers are getting into "stash-busting" this year. I think that is the cure! LOL! Your motif in the coral reef is absolutely beautiful! I am also loving your snowflake, too! The world needs more tatters!!! Congratulations on your first split chain...that is something to be proud of! It's good to see you tatting again, do take it easy. I too have so many books that I have never made anything from, just like to look at them from time to time. The Coral Reef motif looks good. I love the challenge of making everything from one book, am on my second one of those. Your tatting looks terrific! Don't overdo it though... I did too much this weekend, and I think I'll have to take a couple of days off. I tend to spend too much time at one sitting, and that does me in! I know I suffer from Affluenza, but I have started clearing out some of the things that hold absolutely no interest for me any more. It leaves me more time to concentrate on the things I do enjoy! Thanks Sherry, but I was too lazy to get the instructions, so it's not that well done. (I was curled up in armchair with a dog, you'll know how hard it is to move a puppy! Pamela, my problem is buying off internet without knowing what is inside...which is why I appreciate reviews and recommendations in the blogs. I intended to do all Jon's snowflakes...but I seem to have stopped somehow. Diane, yes wrist pain is a nuisance, with those electric stabs, and heated aching, :-( but I enjoy the tatting so much more than writing patients notes! Yes I too buy all of my tatting books unseen, and all too frequently there is not much inside that excites me...but I still keep buying more. I kinda like the thrill of wondering what will be inside, If they were in front of me in a bookstore I wouldn't buy many....so maybe it's a good thing I can't see what they are like!! It's so worth it tho when you come across the odd gem of a book. good to see you tatting again, hope the wrist is holding up ok :-) I'm still off work for at least six more weeks so still taking it easy. Like everyone else, I love books, would be lost without them. All very pretty. My compliments on the split chain. They allude me yet. Thanks for the reminder about "affuenza." I'll get my books out. 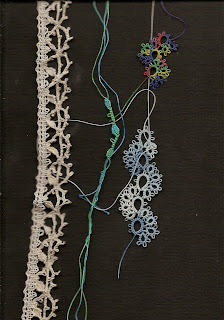 You are doing very well tatting and I hope your wrist is much improved. Take care of your wrist! With your work schedule it sounds as if you could easily overdo things. I remember for several years after I broke a leg it would ache in cold weather. Eventually that cleared up.